Aliso Viejo, CA- August 15th, 2016 – ZETTLER Controls recently unveiled a new 40A contact rating for the AZ2800 series of relays aimed squarely at the burgeoning EVSE marketplace. These double pole relays have long been known as HVAC switches, and most commonly found in compressor and heating circuits. Now, the AZ2800 has found a new home in Level 1 and Level 2 chargers for electric vehicles. The newly acquired 40A@277VAC rating meets the requirements of UL2202 Level 2 charging with branch circuit protection. Coming in both panel mount (AZ2800) and PCB (AZ2850) configurations, the relays are ideally suited to portable and fixed EVSE units. DPST-NO and DPDT versions are available. Lower capacity (3A) NC contacts can be used as part of a contact position monitoring circuit. Pricing of the AZ2800 starts under $4.00 (DPST-NO, DC coil) for quantities of 10,000. Samples and pricing are available on request. 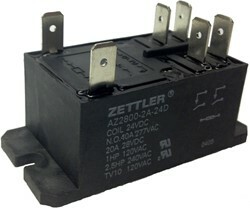 Full specs can be downloaded at http://www.zettlercontrols.com/products/pdfs/az2800.pdf. For more information, contact your local Zettler Controls representative or contact us directly at sales@zettlercontrols.com.